Adaptable to change in your daily workflow, the HELIODENTPLUS offers you the best image quality and the long-term reliability of Sirona equipment. A mobile unit option and three arm lengths make operation safe and easy. Small focal spot generator with preprogrammed digital sensors settings. 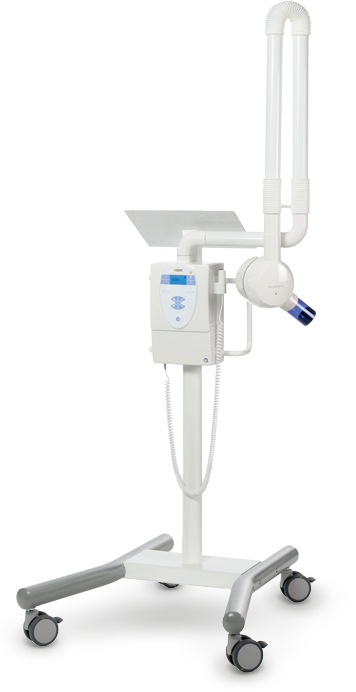 The HELIODENTPLUS intraoral x-ray generator from Sirona Dental. Designed for the needs of any veterinary practice, the HELIODENTPLUS is available for wall mounting with three different arm lengths (59", 71" and 81") or on a mobile stand (59"). The HELIODENTPLUS is a DC x-ray generator providing high voltage and is optimized for digital imaging. Users are able to select either 60 kV or 70 kV at an enviable 7 mA for either optimal contrast or penetration at lower exposure time. And with a 0.04 mm focal spot the HELIODENTPLUS creates significantly less dispersion, which leads to increased sharpness and less noise.